If you’d like to become a homeowner but are unable to obtain a mortgage or pay cash for a home, you’re probably going to have to decide whether or not a land contract is right for you. Land contract buyers have different rights and responsibilities than tenants, and land contracts are different from mortgages in important ways. Download printable version here: Buying on Land Contract? Land contracts can be attractive, but you should take care that you understand the terms of the contract and the obligations you are taking on before you sign. This guide is meant to help you get started in doing just that. This is a short introduction and doesn’t explain every aspect of land contracts, and it probably doesn’t touch on everything that might be relevant to your situation. But it does cover some key areas that are often overlooked by land contract buyers. If at all possible, you should consult with an attorney before signing a land contract. Luckily, there are local agencies which provide free legal advice to people in certain situations. These agencies may or may not be able to provide you with all the help you need, but they are a good place to start. A land contract is a written agreement to purchase real estate which provides that the buyer will pay the purchase price in installments to the seller and will not receive the deed to the property from the seller until the entire purchase price is paid plus any interest or fees accrued. Unlike tenants who rent their homes, land contract buyers usually buy their properties “as-is” and the seller is almost never required to maintain the property or make repairs during the life of the land contract. For this reason, you should inspect the condition of the property inside and out to make sure that you are satisfied with it. Consider hiring a professional to inspect the property for plumbing or electrical problems that might not be obvious. Keep in mind that if there is anything that needs fixing, you will be the one who has to fix it unless the land contract says otherwise. Make sure that you’re buying from someone who actually owns the property. It’s best to pay a title insurance company to check this for you, but you should at least check who owns the property yourself at the county register of deeds. Sometimes figuring out who has legitimate title to a property can be difficult for someone who doesn’t have experience in real estate, so be careful when doing your own research. Check for liens, mortgages or other recorded documents that may affect title to the property. Land contracts must be in writing and signed by both parties. When it comes to the terms of the agreement, what counts is what’s in writing – not what the seller might have told you in person or over the phone. So if you want to be able to make sure that a seller keeps one of their promises they’ve made to you, make sure it’s in the written agreement that they’ve signed. Land contracts do not need to be recorded with the county register of deeds, but the seller should sign a memorandum of land contract and have it notarized so that the memorandum can be recorded with the county register of deeds. This way there will be a public record of your status as a land contract buyer of the property. A memorandum of land contract is a document that notes the existence of a land contract between two parties regarding a certain property. It’s a good idea at the start of a land contract to have the seller sign a deed granting legal ownership of the property to the buyer and have it held in “escrow” by a broker or real estate agent until the contract is fully paid. That way, the deed can still be recorded even if the seller for some reason becomes unavailable or unable to sign the deed by the time you pay off the contract. Sometimes the purchase price for a property in a land contract is much higher than the actual market value of the property. For this reason, you should hire an independent appraiser to judge the market value of the property or at least do your own research as to what similar homes in the area have sold for recently. Land contracts can charge up to 11% in annual interest. Keep the interest rate in mind when estimating how long it will take you to pay off the purchase price and how much you will eventually have to pay to get the deed to the property. Most land contracts have a down payment that you make at the start of the land contract relationship. The down payment isn’t like a security deposit in a lease because you are not entitled to get it back if you end up needing to move. Be careful about large down payments – the more you pay at the start, the more money you may end up losing if things don’t work out. The land contract should give a specific amount that your monthly payments will be. You may also have monthly payments that you are required to make under the contract for property taxes and property insurance (sometimes called “escrow”) – see below for more details on that arrangement. At the beginning of the land contract term, most of your monthly payment will probably go towards paying down the interest on the purchase price. Only later, once you have paid down the purchase price significantly, will most of your monthly payment be used to pay down the purchase price itself. So don’t be surprised if the balance of your purchase price hasn’t been reduced much early in the term of the land contract. Check to see if the land contract requires you to make a balloon payment at any point. A balloon payment is when a contract requires you to pay the seller a large amount of the total amount owed on the contract all at once. If your land contract requires a balloon payment and you fail to make the payment in full when it is due, you will have defaulted on the land contract. Sometimes a balloon payment is implied by the language of a land contract. Land contracts can specify a term – an amount of time that it’s supposed to take for you to pay the entire amount due under the contract. If you haven’t paid off the entire contract amount by the end of the term, you will have to pay any remaining balance all at once. If there’s a specified term, don’t assume that your monthly payments will be enough to pay off the entire contract amount by the end of the term. You can try to check this by doing the math yourself using what are called “amortization calculators” available for free on many websites. What about the property taxes? You should check to see if there are any property taxes owed on the property. The city treasurer or assessor’s office keeps records of property taxes that are owed but not yet delinquent, and the county treasurer’s office keeps records of delinquent property taxes. If there are any property taxes already owing on the property, the land contract should state who is responsible for paying those taxes and when they must be paid. If delinquent property taxes aren’t paid, the county can foreclose and take ownership of the property. The land contract should also state who is responsible for paying the property taxes going forward. Usually, this responsibility falls on the buyer. Some land contracts require the buyer to pay the property taxes directly to the taxing authority. In such arrangements, if the buyer fails to pay the property taxes owing to the authority as they become due, they are considered to have defaulted on the land contract. Other land contracts require the buyer to pay the seller a monthly payment (sometimes called “escrow”) on top of their regular monthly land contract payment to be used by the seller to pay the property taxes as they become due. If your land contract provides for this arrangement, you should check regularly to ensure that the seller is actually paying the property taxes. Check with the water department about any water or sewerage charges that the property might have. Sometimes homes get sold with lots owing on these bills. Unless the agreement states otherwise, you’re responsible for the water bill. Who has to get the property insured? Some land contracts require the buyer to pay for the property to be insured. There are generally two ways this is done. One way is that the buyer is required to get the property insured and pay for it themselves. In such arrangements, if the buyer fails to keep the property insured, they are considered to have defaulted on the land contract. Another way is that the buyer pays the seller a monthly payment (again, sometimes called “escrow”) on top of their regular monthly land contract payment to be used by the seller to keep the property insured. If your land contract provides for this arrangement, you should check to ensure that the seller is actually keeping the property insured. In either case, make sure you and the seller are on the same page about how much the property should be insured for and what should be covered by the insurance policy. If either party fails to perform their duties under the land contract, they are considered to have defaulted on the land contract. If the seller defaults on their obligations under the land contract, you may be able to sue the seller to compel them to perform their obligations and/or compensate you for any damages caused by their failure to perform. If you fail to make payments or fulfill any other obligations (such as paying the property taxes or keeping the property insured), the seller can file a court case to take the house back from you, compel you to perform your obligations, and/or to make you compensate the seller for any damages caused by your failure to perform. The seller can also file a foreclosure action in court, have the house sold at an auction, and take the proceeds from the sale. In most cases, if you default and do not cure your default by becoming current on the contract and meeting all your obligations within a certain legal deadline, the seller can take back the house and keep all money that you have paid so far. If the seller threatens to take you to court, seek legal advice right away. If the seller chooses to take you to court to get the house back from you, they must file the right kind of case. The seller can file a “forfeiture” action or a “foreclosure” action. If the seller files a case for “nonpayment of rent,” “termination of tenancy,” or “recovery of possession of premises,” the case is probably inappropriate if you have a land contract. In order to legally evict you, the owner of the home must take you to court and get a judge to sign a judgment and order authorizing the eviction. They must take certain steps to notify you of the court case and of the first court hearing scheduled in the case. You must have an opportunity to come to the hearing and tell your side of the story to the judge. 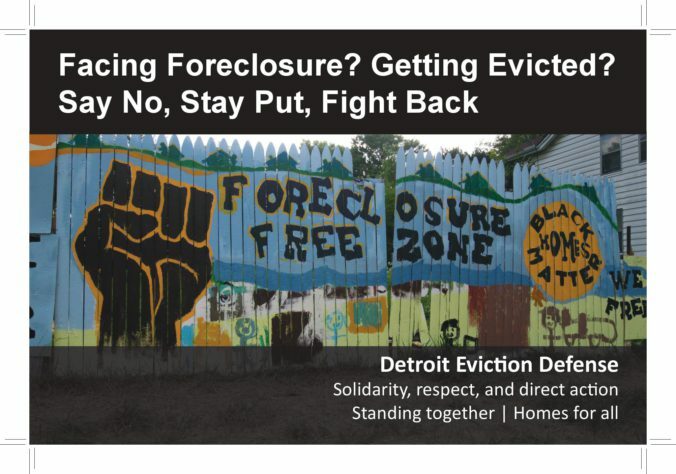 It is illegal for the owner attempt to evict you or threaten to evict you without first going through this process. Some property sellers offer arrangements that blend renting with buying and leases with land contracts. Some of these arrangements involve a “trial period” at the beginning in which the buyer is treated as a tenant, with the promise that the seller will sign an actual land contract or purchase agreement down the line if the buyer fulfills certain obligations. Be wary of these agreements and seek the advice of a lawyer before signing them. If the seller wants you to sign documents labelled “lease” or “option agreement”, get legal help before you sign. Many of these arrangement require buyers to take on many of the responsibilities of a land contract buyer with few of the legal protections. Buying a home isn’t something to rush into. Before you sign a land contract, take the time and do the work to make sure it’s a deal that you understand and that works for you. 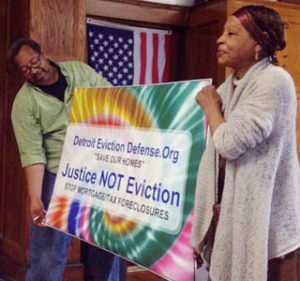 Detroit Eviction Defense (detroitevictiondefense.net) is a volunteer network of home owners, tenants, union members and community advocates united in the struggle against unjust foreclosures and evictions. You are welcome to join us at our meetings every Thursday at 6:00 p.m. at Old St. John’s Church on 2120 Russell in Detroit, on the corner of Russell and Gratiot.